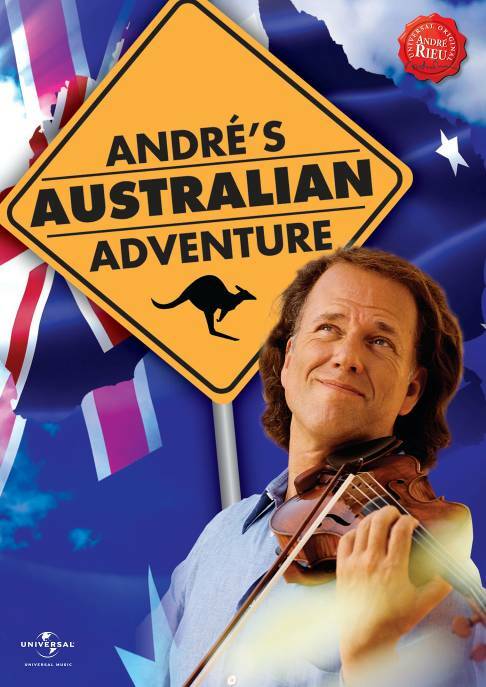 Andre Rieu Australian Adventure DVD filmed here in Australia in 2008. The incredible story of Andre Rieu's Australian success. This DVD includes extensive audience and tour footage from his time in Australia, plus selected commentary in the booklet from his fans. After exploding onto the Australian music charts in 2007, Andr Rieu's journey into the hearts of Australians was effortless and immediate. Talk of his DVD's and music quickly overtook the usual dinner-table conversation and you didn't need to walk far to see a billboard or poster emblazoned with his cheeky smile. Rieu-mania had well and truly begun. A whirlwind promotional visit in September, 2007 cemented the mutual love this country shares with Andr and his unconventional take on classical music. This was quickly followed by the announcement that Andr would soon bring his spectacular World Stadium Tour, complete with life-size replica of Schnbrunn Castle 'down under', sharing this musical passion with his many Australian admirers. Join Andr on a special behind-the-scenes journey, from the moment he lands at Melbourne airport, through the entire tour. Witness the backstage fun, a tropical storm, a day at the beach, a cheese sandwich and a tearful farewell. Following several months of careful planning the time has finally arrived for Andr's Australian Adventure! Click the button below to add the ANDRE RIEU - ANDRES AUSTRALIAN ADVENTURE to your wish list.